DD Form 2936-1 is a U.S. Department of Defense form also known as the "Request For Sponsorship Transfer Of Dod Internal Information Collection". 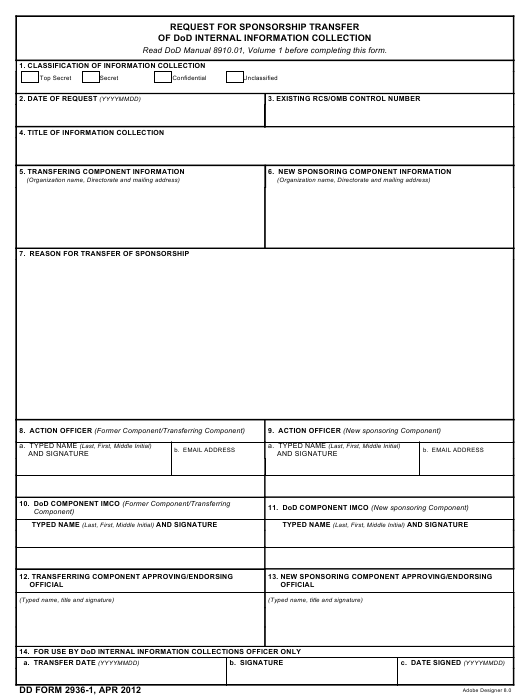 The latest edition of the form was released in April 1, 2012 and is available for digital filing. Download an up-to-date DD Form 2936-1 in PDF-format down below or look it up on the U.S. Department of Defense Forms website. Read DoD Manual 8910.01, Volume 1 before completing this form.